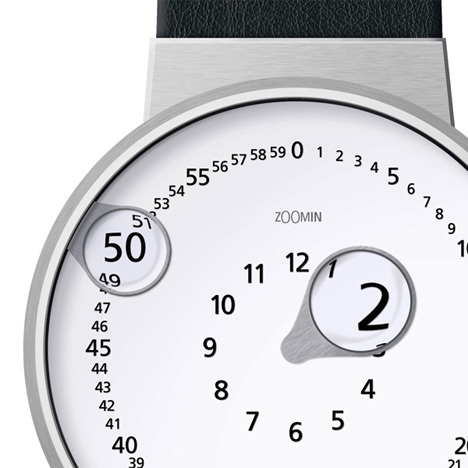 Sleek motif meets punchline-funny eccentricity with the Zoomin Watch. 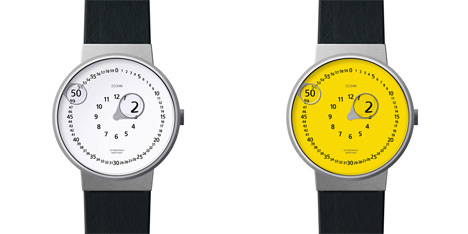 Gennady Martynov and Emre Cetinkoprulu designed this nifty number which uses magnifying glasses to tell the time. And no, it’s not just for your grandfather. The outer ring is adorned with all of the seconds contained in a minute. To fit them all in, the designers made them tiny and added a hovering magnifying glass to make them pop out. As the magnifying glass circles around the face, you can keep track of the minutes by which is magnified at the time. The same thing is done to tell the hour. The inner ring, containing the numbers 1-12, also sports a magnifying glass for a kind of double-pop effect. 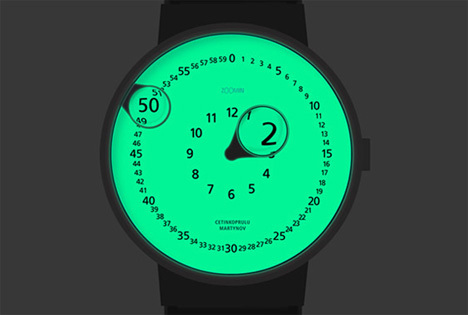 This remarkable timepiece cleverly makes use of a classic idea. It’s like having a little mini Sherlock Holmes strapped to your wrist. See more in Clocks & Watches or under Gadgets. June, 2013.